Visitors offering broken household items for repair do so at their own risk. Repairs are not guaranteed. Fixers will help visitors to learn the repair process on items brought in. To the extent possible, fixers will help visitors do the repair themselves, or fixer and visitor will conduct the repair together, or the fixer will demonstrate the repair process to the visitor. 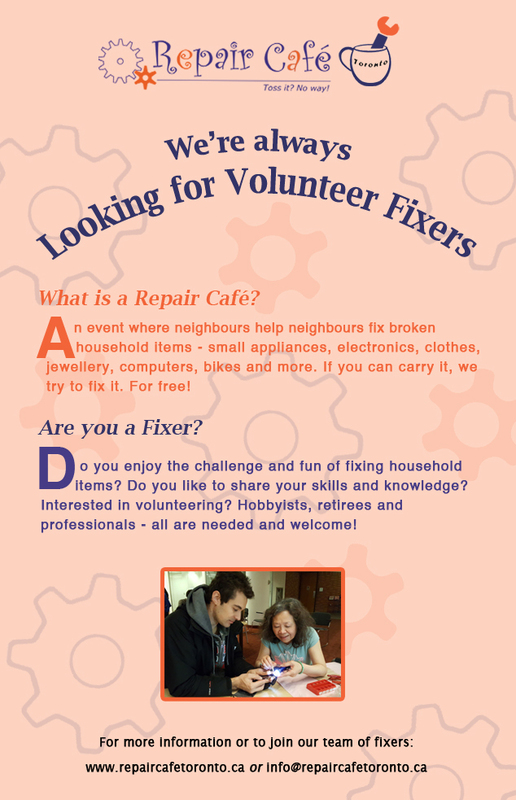 Work carried out in the Repair Café is performed free of charge by individuals doing so entirely on a voluntary basis. A voluntary donation by visitors to Repair Café Toronto is appreciated to help sustain the operation of Repair Café Toronto. To reduce wait times, a fixer will work on only one item per visitor. Visitors will join the back of the queue for additional items to be fixed. In general, new replacement parts will not be provided by Repair Café Toronto. Fixers are entitled to refuse to repair certain objects. Visitors are responsible for cleaning their items. Visitors to the Repair Café are solely responsible for the tidy removal of items brought in that could not be repaired. All safety procedures must be followed. All electrical items must be unplugged while being disassembled. All heating devices must be thoroughly cleaned before powering on (e.g. space heaters, toasters, hair dryers). When using test equipment, clip-on leads must be used to ensure non-contact when item is powered on. When testing a disassembled item, a power bar must be used in order to turn power off and on. When using sharp tools or power tools, appropriate personal protective equipment must be used, such as eye and hand protection. Work space should be kept tidy and hazard-free. Food and drink should not be consumed during repair activities. The year of manufacture of heating products must be checked with visitors. Such items more than 20 years old must not be opened at the Repair Café. No built-in safety features (e.g. fuses, safety switches) will be bypassed. We welcome all members of the community and ask that everyone attending the Repair Café knows and follows this code of conduct. Failure to do so may result in denial of repair service and dismissal from the event. Treat everyone with respect including volunteers, visitors, and venue staff. Harassment, bullying and discrimination of any kind is prohibited. Respect the host venue property and the property of volunteers. Cooperate with the registration process, repair waiting line and repair work. Be considerate of individuals’ sensitivities. Some people are sensitive to loud sounds and strong scents. Respect people’s privacy. If you take pictures or make recordings, you must inform a registration volunteer and ask anyone being photographed or recorded for their individual permission. Report any breaches in the code of conduct to the Repair Café registration volunteers. If you have any questions, please ask. Volunteers are Needed and Welcome!